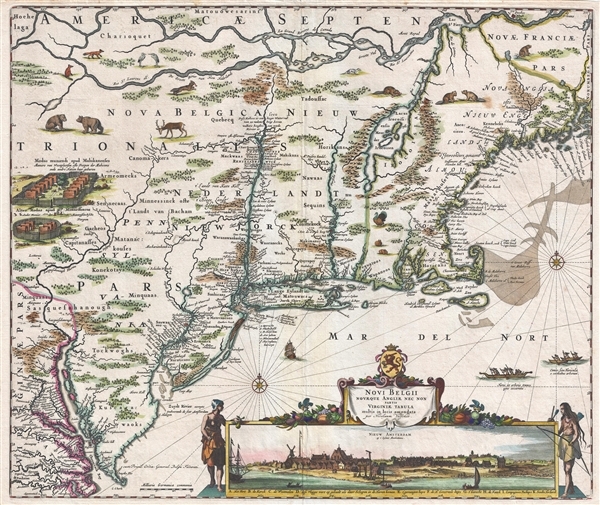 Iconic early map of New England and New York with 'Visscher View' of New Amsterdam. A map of extreme importance, this is a fine example of Nicholaas Visscher's 1684 Novi Belgii or map of New York, New England, Pennsylvania, and Virginia. This is the first map in the Jansson-Visscher Series here presented in its 4th state (Burden, 315). Like most maps in the Jansson-Visscher Series, the basic cartography here dates to the Jansson map of 1651. It covers from the St. Lawrence River to the Mouth of the Chesapeake Bay and from the Susquehanna River to the Penobscot River, incorporating in the process most of New England, New York, Pennsylvania, New Jersey, Virginia, Maryland, and Delaware. This map is of considerable importance to the history and colonization of New York and New England. Most scholarship suggests that the Visscher map dates to about 1655, but may be as early as 1653, a time of turmoil for the New Amsterdam colony. The Dutch West India Company, the titular owner of the colony, had little interest in their North American outpost. Their attentions were instead fixed on the more profitable sugar trade in South America. As a consequence, New Amsterdam found itself lacking both support and infrastructure. The struggling colony, despite an appeal directly to the States General, was ripe of the plucking and thus surrendered in 1664, with barely a word of protest, to English naval commander Richard Nicolls. The English, who were keenly interested in developing the fur trade, had big plans for New Amsterdam, now renamed New York. Versions of this map thus played a key role in many subsequent developments. Initially, the map's lively depiction of abundant wildlife, particularly beavers, and thriving indigenous villages served as propaganda for expanding the Dutch colony. Later it was used to address colonial boundary disputes, such as the conflict between William Penn and Lord Baltimore of Maryland. The dramatic view of the southern tip of Manhattan that appears in the lower right quadrant is based upon a similar view printed on the Visscher Map. This view based upon a 1648 watercolor, now in Vienna's Albertina, was painted by Augustin Herman (c. 1621 – 1686). The watercolor view was first adopted to print by Joan Blaeu for presentation alongside Van der Donck's 1650 Remonstrance - essentially an appeal directly to the States General to intervene with the Dutch West India Company and force additional support for the New Amsterdam (New York) colony. The view was subsequently incorporated into Visscher's map of 1655. This map proved popular and the illustration became known, somewhat erroneously, as the 'Visscher View.' Despite being more common on the map, this view was also issued separately and, as possibly the first view of Manhattan, is exceeding rare and important. According to Burden, the Visscher map exists in five known states. The first state (1655), is very rare, with only a few examples known, is identifiable for the lack for Fort Kasimier on the Delaware River. The second state (1656) has Fort Kasimier, but lacks Philadelphia. The third state (1684), adds Philadelphia. A fourth state (1684), offered here, issued later in the same year, adds a note privilege to the left of the view. The fifth and final state (1729), bears the Petrus Schenk imprint. Very good condition. Slight tallow stain upper right quadrant. Original plate mark. Blank on verso. Burden, P, The Mapping of North America II, #315, state 4.